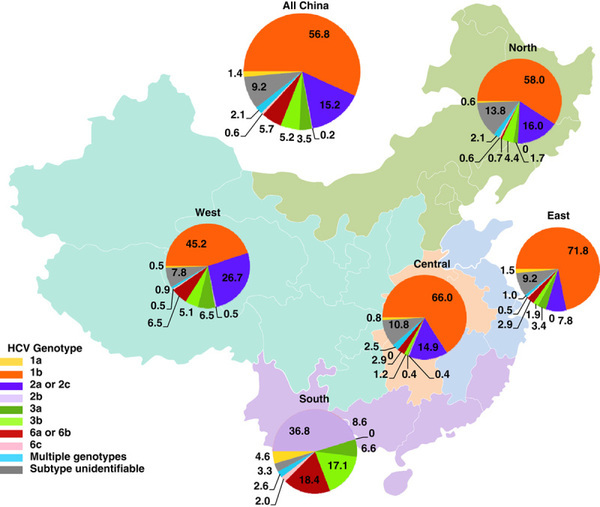 I mentioned in previous articles that genotypes of Chinese hepatitis C patients are mainly 1b and 2a/c, with the number of hepatitis C patients of about 26 million in total but treatment rate of less than 0.5%! The market space is huge. Since the marketing of DAAs in 2017, many DAAs have entered China, which will change the traditional hepatitis C therapeutic regimen of peginterferon (Peg-IFN-α) in combination with ribavirin. China has begun to enter the era of hepatitis C cure!! So far, there have been many enterprises marketing DAA hepatitis C drugs in China, and Kawin Technology, Gilead, and AbbVie separately have one relevant drug filed the marketing application to NMPA. As the only all-oral, pan-genotypic, single tablet new hepatitis C drug in China, Epclusa has been included in the 2018 Edition National Essential Drugs List of China. Its selling price in China cannot be found at the moment. We look forward to that Epclusa will offer help to the era of hepatitis C cure in China, although inclusion in the said list is no longer the solid backing of sales and its inclusion in the medical insurance payment is not certain. For now, relevant knowledge and consultation rate of Chinese hepatitis C patients must be improved. DAAs are still a big burden to most hepatitis C patients, however, hepatitis C cure is of profound significance.